Product #20465 | SKU 1SKB-R106 | 0.0 (no ratings yet) Thanks for your rating! The 10x6 Roto Rack Console by SKB is a 16U travel and storage case for the mobile DJ. Its slanted 10U top rack is designed for DJ gear less than 15.24cm in depth while the 6U bottom rack holds all standard 19" gear. 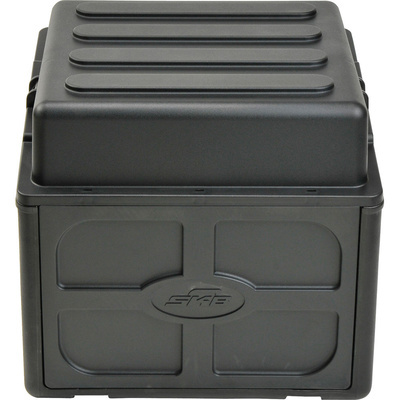 The unibody base is roto-moulded of Linear Medium Density Polyethylene while the lid and doors are injection moulded of Rubber Modified Styrene. Durable steel threaded rails allow you to mount even the heaviest of rack gear securely and the side access ports are perfect to keep your cables neat and organised. The Roto Rack Console features SKB's patented TSA industrial strength trigger release latching system which ensures the lid is on securely and your gear remains safe. Even with the lid closed, the case provides enough space to mount SKB's new AV-8 audio/video shelf which is an ideal accessory as it provides a perfect place for a laptop or video projector.